I have long believed that there is some as-yet-unknown mental secret that will unlock the vast hidden resources of athletes and allow even an aging jock like me to beat players much younger and stronger. My belief comes from the way my own athletic performance varies so wildly depending on my state of mind. Unfortunately, I’ve never clearly identified what state of mind leads to increased performance. All efforts to control my mind have been erratic and often frustrating. Bells went off in my head. I had heard each of those words — focus and concentrate — many times separately. But I have never heard them together and spoken by someone who’s back them up with such a remarkable level of performance. I arranged to meet Dr. Amberry and watch him shoot. 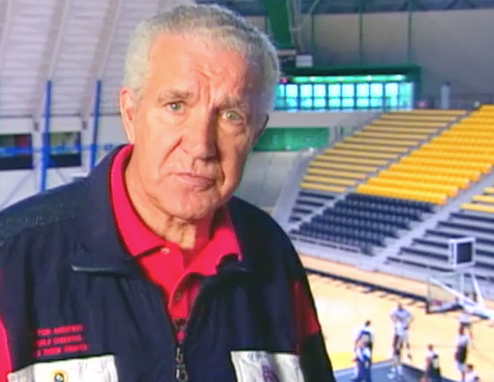 The first time I heard of Dr. Tom Amberry, the world champion free throw shooter, was when I was sitting in a donut store having a cup of coffee. 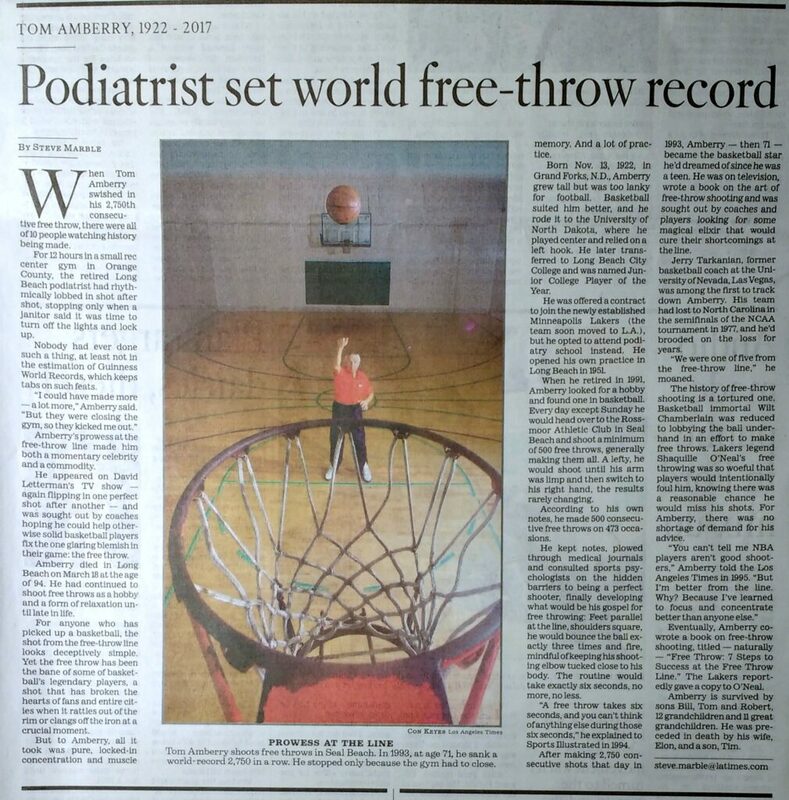 I was skimming a local newspaper, and my eye fell on a story about a 71-year-old retired podiatrist who had made 2,750 free throws in a row to enter the Guinness Book of Records. I can remember thinking there had to be a mistake there somewhere. No one is capable of that level of perfection, especially at that age. In the story Dr. Amberry was quoted as saying that his free throw shooting routine took six seconds and was like “auto hypnosis.” Hypnosis has lurked around the edges of sports in an intriguing way for many years. But the idea of packaging it in six-second doses was new and very attractive to me. With stories of Dr. Tom Amberry’s death hitting the news sites all over the world, his book has become the #1 best seller in the basketball category on Amazon.com. Even books with exciting names like “Jump Attack” and “Playing Big” have, for today, taken a back seat to Free Throw. The book I wrote with Dr. Tom came out in 1996. One of the frustrations of writing a book is that you never really know it’s impact of people’s lives. Occasionally, you get glimpses of what your words have done in emails, letters or phone calls. One of the more unusual responses came through a mutual friend, Jim Ullrich, from Conroe, Texas. Jim, a former college basketball player, and a fine free throw shooter himself — making 249 in a row and over 100 numerous times — ordered used copies of our book to give to his clients in his accounting practice. One book he bought used had apparently been read many times by an unknown coach. This coach had written hundreds of his own comments in the margin of the book, notes to himself about how to better coach this method to his own players. The comments were intelligent, insightful and could have almost been the basis of another book. It amazed me to think of someone pouring over our words in such detail. Many other readers contacted Dr. Tom asking for free throw shooting advice. Dr. Tom always had time to help them and often, just his words, and encouragement, would bring about an improvement. One proud parent even send a video of her 12-year-old daughter making two free throws at the end of a game to win a championship. Dr. Tom used to say, “A free throw is a gift, a point for you and your team.” Free throws were, in deed, a gift to Dr. Tom and to everyone who met him. Philip Reed, Long Beach, Calif.
I’ve spent much of today reading obituaries for my friend, Dr. Tom Amberry, the world’s champion free throw shooter who made 2,750 in a row. I am pleased that the Los Angeles Times and the Washington Post both wrote their own accounts of Tom’s life. I wish my friend, who I called Dr. Tom, was here to see the warmth and admiration people felt for him. I met Dr. Tom after reading in a local paper that he had shot free throws on the Letterman Show. At that time I was trying to break into sports biography writing. But when I read about Dr. Tom, I realized he must know something that would help me become a better golfer. I called him, and asked for his help. He said, “I can’t tell you anything about golf — but I can teach you to focus and concentrate.” I co-wrote the book Free Throw; 7 Steps to Success at the Free Throw Line published by HarperCollins in 1996. I had many adventures with Dr. Tom over the last 20 years. Two stand out in my mind. I wrote an essay that earned Dr. Tom the KFC Colonel’s Way Award. Actor Tony Randall gave him a check for $10,000 and Tom flew away on a private jet with the vice president of Pepsi to do talk shows in New York. I got a check for $1,000 and, as Dr. Tom liked to kid me, “all the Kentucky fried chicken I could eat.” I flew home coach. Another time, Tom was challenged to a free throw shootout at the Los Angeles Athletic club for a fund raiser. He was supposed to shoot against the great basketball player Bill Sharman but at the last minute they substituted then-Los Angeles Laker Joe Kleine, a 7-foot center. With hundreds of people watching from the running track above the basketball court, and a sports announcer barking out the count, Kleine sunk 23 out of 25 free throws. I was a little surprised he did so well and felt a bit nervous for my friend. But Dr. Tom stepped to the line and began drilling free throws with such certainty it was obvious he would make them all. Watching this, Kleine decided to do something unexpected. When Tom looked down to bounce the ball three times, Kleine slid behind the basket and, just as Dr. Tom looked up to shoot, he yelled and waved his arms. The ball hit the hoop and bounced out. The crowd gasped in horror as if they had just seen a murder. Dr. Tom made the next free throw, and the next and was soon back in his rhythm. Kleine tried his distraction again but to no avail. Each of the remaining balls hit their mark and Dr. Tom finished with 24 out of 25 free throws, edging the NBA player by one. These were impressive accomplishments, but being with Dr. Tom on a day-to-day basis was what I will miss most. Until the end he spoke with a North Dakota twang and had a playful, but corny, sense of humor. Most of all, he tried to connect with everyone he met, young or old, famous or unknown. Dr. Tom Amberry, who held the world record for making 2,750 free throws in a row, passed away Saturday evening, March 18, at the age of 94. This amazing accomplishment, which took 12 hours, was in the Guinness Book of Records for years. His accomplishment earned him appearances on national television, including the “David Letterman Show,” and NBC Nightly News. Many articles were written about him including an indepth profile in the Los Angeles Times. Amberry, who stood 6’7” tall, played for the University of North Dakota and Long Beach City College in the 1940s. He was twice All-American and the nation’s leading scorer. During World War II Amberry served in the U.S. Navy and was on a destroyer at D-Day. Returning to the U.S. he played for the Minneapolis Lakers but then became a podiatrist, practicing in the Long Beach area and treating athletes such as Billie Jean King. After retiring in 1991, Amberry returned to basketball and took up free throw shooting as a hobby. He began practicing and researching the best biomechanics for this crucial shot, consulting medical journals and sports psychologists. 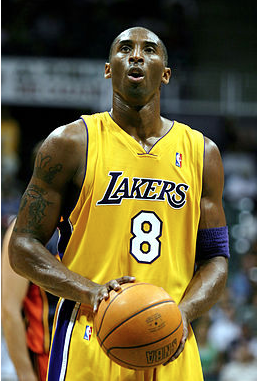 Once he locked in his method, he began shooting 500 free throws a day. A natural left handed shooter, he wore out his shoulder practicing but, undaunted, switched to shooting righty. He set the world’s record using his “off hand.” According to the meticulous records he kept, Amberry made 500 consecutive free throws on 473 separate occasions. 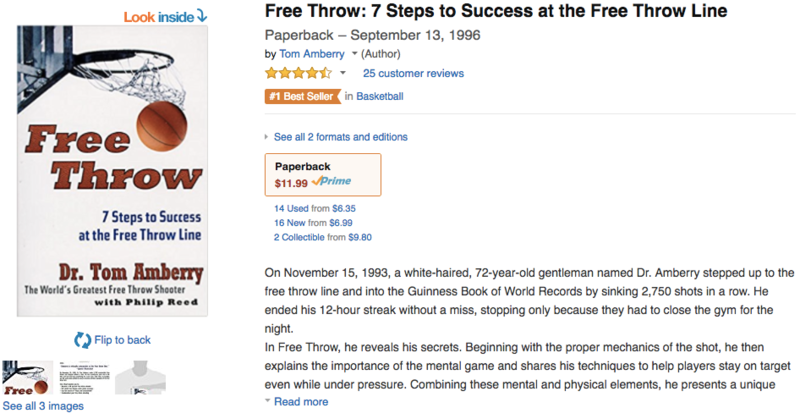 In 1996 Amberry co-wrote Free Throw; 7 Steps to Success at the Free Throw Line, published by HarperCollins. Amberry helped Chicago Bulls Coach Bill Cartwright raise his team’s free throw shooting percentage and coached many college and high school players. He had “shoot outs” against NBA players and never lost. Amberry was born on Nov. 13, 1922 in Grand Forks, the son of a Welsh immigrant who was a bodyguard that sometimes boxed professionally. At 152 pounds Amberry was too thin for football but played basketball and baseball, earning a sports scholarship. Amberry was preceded in death by his wife, Elon, and one son, Tim. He is survived by his sons, Bill, Tom and Robert and 12 grandchildren and 11 great grandchildren. A friend looked at slow motion video of my free throw shot after I set the world’s free throw record by making 2,750 free throws in a row. He had a question. If you download my video, you’ll see that, just before I shoot, I pull my arm back just a little — but always the same amount. If you look at the motion of all the great shooters you’ll see that, when they have time — and on longer shots — they have a small extra motion as they load up and shoot. It’s like they’re trying to get the feel of the shot before they let it go. They put their arm in the slot. And find the back of the net. In other sports athletes subconsciously develop hitches, twitches, rituals and quirks that keep them loose and increase their feel. In basketball, let’s face it, the free throw is a feel shot. You initiate the shot and decide when to let it go. That’s part of what befuddles many players. They actually shoot better under pressure, because they don’t have time to think. I have a friend who’s a big golfer and they actually have a name for their hitch. They call it the “waggle.” It’s a small rehearsal of the real swing. Another reason to develop a shooting hitch is because, at least from the line, it delivers the same amount of distance each time. My mantra is: do the same thing every time and the ball goes in the basket. Get the ball in the right position, bend your legs, put your arm in the slot. 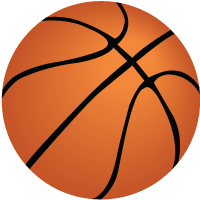 Think about how you feel when the ball is in your fingers, you’re looking at the basket and you know you’re going to sink the basket. That’s the feeling you want to develop. And having a little hitch will trigger that feeling. While we’re waiting for the Final Four, I want you to look at these videos: one of Steve Nash , and the other of Stephen Curry, both shooting free throws. Both Steve Nash and Stephen Curry are the same height (6’3″) and have the same career average in free throws (90%). Now, Nash shoots with his feet square on the line, as I recommend. You see that Curry has his right foot slightly forward. Both, however, have the correct mechanics when it comes to keeping their eye on the basket, shooting and following through. They have mastered another fundamental of free throw shooting: because they build it into their regular practice, their focus and concentration on the free throw line is that much stronger. The point I am making is this: different players can make different styles work. As long as the mechanics are in order, your results will be strong.